The fundamental equations of radiative transfer have the Second Law of Thermodynamics built into them, via Kirchoff's Law, which can be derived directly from the 2nd Law. Thus when solved numerically the solutions perforce obey the 2nd law. This applies equally well to simple models described below, and to the most elaborate line-by-line calculations. All show that the presence of greenhouse gases in the atmosphere results in a warmer surface than in their absence. Gerlich and Tscheuschner  make fundamental mistakes in their arguments about the thermodynamics of the greenhouse effect which are profoundly revealing. They invoke Clausius' classic statement of the Second Law of Thermodynamics, no process is possible whose result is the transfer of heat from a cooler to a hotter body, to claim that thermal radiative energy from the colder atmosphere cannot warm the hotter surface (principally section 3.9 of Ref. 1). When following how energy moves between the sun, the Earth's surface and atmosphere, and space, the increases in entropy through every step of the process are simple and obvious, and the net energy flows are always from hotter to colder, as they must be. Estimation of the greenhouse effect contrasts cases when there is no atmosphere, or an atmosphere with no greenhouse gases to cases where there are varying amounts of greenhouse gases. The simplest calculations require significant simplifications but capture the essence of the situation. Radiative transfer models provide detailed information at the cost of complexity. In all cases surface temperatures are found to be higher for higher greenhouse gas concentrations. Fig. 32. A machine which transfers heat from a low temperature reservoir (e.g., stratosphere) to a high temperature reservoir (e.g., atmosphere) without external work applied, cannot exist — even if it is radiatively coupled to an environment, to which it is radiatively balanced. A modern climate model is supposed to be such a variant of a perpetuum mobile of the second kind. Their view of the second law is both clear and clearly wrong. The simplest explanation of why it wrong is that the Clausius statement refers to an entire process, not a single part of it. By isolating transfer from the colder atmosphere to the warmer surface they are neglecting heat transfer in the reverse direction. Radiative transfer is discussed below using simplified examples to appreciate how the greenhouse effect is a result of basic physics, consistent with all the laws of thermodynamics, and to show how Ref. 1 errs. There appears to be confusion about whether the Clausius statement applies to net heat flow or simply any flows of heat. Qualitatively one can make a simple argument about interchange of thermal energy between two bodies. Consider two perfectly absorbing disks in a vacuum at temperatures TA and TB, with TA > TB. If B is isolated, it will emit thermal energy at a rate given by the Stefan-Boltzmann Law. If the Clausius statement referred to any flow of heat when the two disks were placed opposite each other B would have to stop radiating towards A because if it did not, heat would be transferred between a body at lower temperature to a body at higher temperature. This is obviously absurd. The ability of either disk to radiate does not depend on the presence of another disk that absorbs the emitted radiation. Further it is not necessary to restrict the heat transfer mechanism to radiation, the same argument holds when energy is transferred by molecular motion, or electrons. Thus, the Clausius statement clearly must apply only to net heat flow, and one must consider all heat flows when applying the second law and not just selected flows in isolation from the others. Using Fig. 32 and in other places in Ref. 1., Gerlich and Tscheuschner repeatedly apply the second law to the isolated heat flow between the atmosphere and the surface and from this conclude that the greenhouse effect is impossible because it would be a perpetual motion machine of the second kind. We have shown that this is an absurd argument and thus the most basic part of their thesis fails. One can illustrate this quantitatively in a simplified manner with an idealized example. Again we use two infinite, flat and parallel plates. In this case we will treat the two plates as infinite heat sinks. For the sake of argument Face A is at 300K, face B at 260 K, somewhat the temperatures of the surface and the level of the atmosphere at which greenhouse gases radiate to space. Using the Stefan- Boltzmann law we can calculate the thermal energy and entropy exchanges between the two plates as shown in Fig. 1 which is similar to that of Fig. 32 of Ref. 1 except that includes heat transfer in both directions, which, as was discussed above, must be the case. Only heat is transferred, energy is conserved and, the net entropy increase of the entire system is positive as the second law requires, but equally clearly, the colder body radiates thermal energy that the hotter body absorbs. The argument of Ref. 1, which considers only part of the process is unphysical and wrong. The Clausius statement is about a complete process, not what happens to individual steps. The example makes clear that there is an interchange of heat by radiation between the colder and the warmer surface. Such an interchange occurs because the net entropy change for the process is positive. In the idealized example the disks were considered infinite. If they were finite, they would eventually reach a common temperature, however, the argument would be essentially the same for the process with minor changes to account for the changing temperatures of the disks. The point with respect to Ref. 1 is not the details of the process, but the fact that there must be constant heat exchange from the colder to the hotter disk, as well as a larger one from the hotter to the colder. These simplest examples can be expanded upon. Consider a spherical body whose temperature is maintained at T. Around it place two concentric shells A and B, each infinitesimally larger than the other. Surrounding all this is empty space at absolute zero . For convenience treat everything as perfect blackbodies. The net energy flow from A to B is (1/3)σT4 The assumptions that the spheres are perfect blackbodies and the radii of the shells are only slightly larger than the radius of the sphere could be relaxed at the expense of making the solution more complex. Thus, the addition of the Shell B has caused the temperature of Shell A to be higher than it would be in the absence of Shell B (~0.90 T instead of ~0.84 T), yet Shell B is at a lower temperature than Shell A. This is exactly the situation that Gerlich and Tscheuschner claim would violate the Second Law of Thermodynamics, i.e., that we have warmed an object (Shell A) to a higher temperature than it would have an the absence of the “back-radiation” from a cooler object (Shell B). Of course, as one can see, the net heat flow is from Shell A to Shell B and thus the 2nd law is not in fact violated, just as is true of the earth / atmosphere case where the net flow of heat is from the earth to the atmosphere and yet the presence of the IR-absorbing atmosphere still results in the surface being warmer than it would be without greenhouse gases. The entropy flux of the Earth is interesting. Suppose the Earth had no greenhouse gases. Ideally, it would, as discussed elsewhere, receive at its surface 235 W/m2 at the surface at 255K, and radiate it back as IR. The influx creates 235/255=0.92 W/m2/K entropy, but exactly the same amount is radiated out. What is not usually noted is that this allows for no creation of negative entropy on Earth except for biologically and chemically driven processes. No winds, no heat conduction. For these to happen, the Earth (which is not an isolated system) export net entropy. In other words having absorbed thermal energy from the sun, some portion of this must be transformed into free energy, capable of creating physical work to drive circulation. Since the outflux equals the influx of radiant heat, that means that at least some of the outgoing radiation must be emitted at a temperature lower than that at which the incoming was thermalized (so Q/T is higher). Due to the greenhouse effect, this happens. A substantial part of the IR leaves from the top of the atmosphere (TOA) at a much cooler temperature. In crude terms, if the greenhouse effect raises the surface temp from 255K to 288 K, the net entropy exported is 235/255-235/288 =0.106 W/m2/K. This is the entropy created by the wind. So the greenhouse effect does more than just keep us warm. It excretes our entropy garbage. The atmosphere can be treated as a huge heat engine, and the net entropy export is the driver. Eli - entropy creation is a tricky business, and I think you've actually fallen into a bit of a trap here. Total entropy production by Earth is pretty much the same with and without GHG's. What the GHG's allow is energy capture by the surface at a *higher* temperature than the final emission temperature, resulting in an opportunity to use some of the Sun's energy in a useful way rather than just sending it back into space after immediate thermalization. The point of entropy creation is when the energy gets thermalized, and the higher the temperature of thermalization, the lower the quantity of entropy (per unit energy/heat - obviously from the deltaQ/T relation, though it's not intuitive). So by raising Earth's surface temperature, GHG's allow thermalization of incoming solar at a higher temperature and therefore lower entropy per unit input energy, and therefore leave lots of room for more entropy creation before the energy leaves the planet again. The advantage of things like solar photovoltaic cells or concentrating solar thermal systems is that they capture the photons before thermalization at Earth's surface, and so the energy they capture is at much lower entropy-per-unit-energy, and can do much more useful work. I also think there's an even more powerful argument than the straightforward demonstration you present here of the entropy change associated with radiation between two heat baths. *ANY* form of energy interchange between two heat baths will, at the microscopic level, involve some processes that decrease entropy accompanied by others that increase it. If the two heat baths were ideal gas chambers, and you exchanged energy by opening a small channel between them, then a small number of gas molecules from the cold bath would enter the hot one, even as molecules from the hot bath entered the cold one. Same sort of issue at the microscopic level, and it is only the net, statistical average that obeys the classical second law, not the individual microscopic processes. The point of it is, you cannot turn off the radiation (or microscopic flow of molecules) from cold to hot without also turning off the radiation (or molecule flow) in the other direction. The process is "atomic" in the sense of indivisible, and so treating one side in isolation of the other and claiming a second law violation is profoundly, stupidly, absurdly wrong. however, I would further like to point out, I don't *think* this is quite what G&T are arguing. Rather, like their long diatribe on the "greenhouse", they seem to be focusing on the claim that GHG's causing "warming". Their language is opaque and confused so it's hard to tell, but I believe the layer at which they are wrong may be slightly deeper than this argument considers. (a) Derive the steady-state temperature T_A of Shell A when Shell B is not present. (b) Derive the steady-state temperature T_A of Shell A and T_B of Shell B when Shell B is present. (c) What is the net radiant heat flow (W/m^2) between Shell A and Shell B? (a) T_A = T / 2^(1/4), which is ~0.841 T.
(b) T_A = T * (2/ 3)^(1/4), which is ~0.903 T and T_B = T / 3^(1/4), which is ~0.760 T.
(c) (1/3)*sigma*T^4 from A to B. So, what we have is a situation where the addition of the Shell B has caused the temperature of Shell A to be higher than it would be in the absence of Shell B (~0.903 T instead of ~0.841 T), yet Shell B is at a lower temperature than Shell A. This is the sort of situation that G&T claim would violate the Second Law of Thermodynamics, i.e., that we have warmed an object (Shell A) to a warmer temperature than it would have an the absence of the “back-radiation” from a cooler object (Shell B). 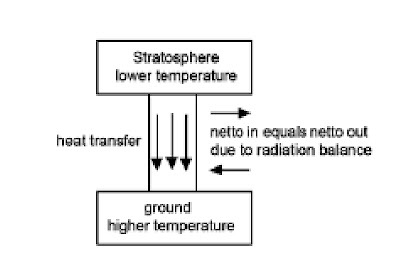 Of course, as you can see, the net heat flow is from Shell A to Shell B and thus the 2nd law is not in fact violated, just as is true of the earth / atmosphere case where the net flow of heat is from the earth to the atmosphere and yet the presence of the IR-absorbing atmosphere still results in the earth being warmer. Joel's argument does capture the layer at which I believe their thinking was wrong, though unfortunately it's impossible to come up with an analogy that is proof against any distorted attack (literal greenhouses are a perfectly valid analogy in some respects, but obviously got no such respect from G&T). And I'd like to clarify my own analogy on molecular exchange between heat baths - the point applies if there is some barrier between the baths that only molecules of kinetic energy higher than the average on both sides are able to cross - in that case the hot molecules crossing from the cold bath will heat up the warm bath slightly - but there will be far more hot molecules crossing from warm to cold, so the net exchange obeys the second law, even while it is violated if you look at one direction in isolation. It seems to me that the real problem here is that th authors of the paper do not adequately define what they mean, so it is very hard indeed (if not impossible) to "counter" such arguments. A simple statement that "the atmospheric greenhouse effect violates the second law of thermodynamics" is pretty meaningless in and of itself. If the paper by G&T is really a "review" or crtiique, it is up to them to properly lay out precisely how the second law is violated. Simply saying that heat does not flow from a cooler to a warmer body is not sufficient. Not even close. The most basic question here is how can one even argue with incoherent, ill-defined arguments? I would suggest that it is a waste of time even trying because even if one succeeds iin "debunking" the specific argument(s) of G&T, the authors can (will?) always com back and say "No, that is not what I was arguing at all." It is a losing battle. I think this really gets at the crux of the problem: by "arguing" with people who have no clue what they are talking about, one lends credance to their arguments. no physicist in his right mind would engage most of the claims on the web and elsewhere by cranks that they have "disproved" relativity theory. So why do climate scientists (and scientifically literate bloggers interested in climate science) do it? I think Gavin Schmidt's is the proper response in this case: "It’s garbage. A ragbag of irrelevant physics strung together incoherently." it may or may not be worth putting a lot of effort into a response, given the ill-definedness and all the other problems. However, as I observed over at Deltoid, I'm more interested in how this got through and whether or not that process is repairable. Has Joel gotten an answer back from the editors? Has anyone? Although this is far too small a sample, we've now seen several cases of physics journals/newsletters printing such stuff. Is that just that just random, or is there a structural reason? I think you get to the crux of the issue. As to your question to me, yes, I got a short response back from Dr. Wolfram Schommers and it was, frankly, very weak. I won't quote it exactly since I don't have his permission to do so but suffice it to say that he just told me that I can submit to them a scientific statement regarding the paper and he commented that my e-mail "contains a lot of polemic", which I found particularly ironic since what I wrote was simply an e-mail whereas what they published was supposed to be a review article and was itself very polemical...In fact, G&T even used some of the same polemical words that I did ("nonsense", "pseudoscientific"). [Apparently, this journal has higher standards for e-mails sent to the editors than it does for papers published in the journal.] I pointed this irony out in a reply e-mail but have not received any further response from him. I think the answer to Leif's criticism is to insert something to the effect that for the example we have assumed that the two plates are attached to infinite heat baths while in the real situation you have to include the solar source and space, which is a thermal sink at 3K, but the principle is illustrative. Perhaps you would try your hand on that and report back. You know, I'm wondering if the best response (if the editors of IJMP-B don't respond appropriately) might be a piece for Physics Today. I know a couple of people who write some of their "News" articles, this might be right up their alley. Do we have a list of people prepared to go on public record about the quality of G&T's article? The answer to Leif's criticism is that the system does not have to stay at those temperatures. It's perfectly valid to analyse the energy and entropy flows at an instant in time in a varying system. Since radiation processes are very fast, "steady state" need only last for milliseconds. But if you want to, you can do the accounting allowing for heat flows to maintain a steady state. The system does not have to be isolated - you just have to be able to identify the influx and outflux. That's why it is interesting to try to account for the nett production of entropy on the Earth, and to explain why we don't have a local "heat death". If, as the Rabett said in another thread, this was actually peer-reviewed, (hard thought it may be to believe), it's a reminder that the most important thing a proposed referee can say is "I do not have the expertise to review this paper." "Fig. 32. A machine which transfers heat from a low temperature reservoir (e.g., stratosphere) to a high temperature reservoir (e.g., atmosphere) without external work applied, cannot exist — even if it is radiatively coupled to an environment, to which it is radiatively balanced. A modern climate model is supposed to be such a variant of a perpetuum mobile of the second kind." So we don't have to consider any of the more sensible variants here. I've updated the text to reflect some of the comments and am still working. I'm going to add Joel Shores spheres tonight. Eli - much improved argument this iteration. There are some minor typos ("visa versa"???) but maybe we're not at the point to nitpick on that kind of thing yet? Looking forward to your addition of Joel's piece to this. You don't really *need* GHG's to provide Earth with free energy - if plants could somehow have developed at 255 K, they also capture photons before thermalization: green plants (like solar power) also allow for entropy increase in the Earth system with or without GHG's. On the other hand, GHG's certainly make the atmosphere much more interesting - there's essentially no tropopause without them, for instance. I agree with Arthur that photosynthesis and respiration should be omitted from the list of processes that are enabled by the GE, through its creation of a free energy differential between the point at which sunlight is thermalised and IR emitted. But many other important processes are thus enabled. here is a similar argument with flat sheets, phrased to show that varying the temperature of the outer layer varies the temperature of the middle one, even though it is colder. Yes, it's more directly in line with G&T "thinking". I like the current version better now and I like how you have incorporated my argument into the text. I do have one comment. Your writeup says, "According to Gerlich and Tscheuschner if one places the two disks opposite each other, B must stop radiating towards A because if it did not, heat would be transferred between a body at lower temperature to a body at higher temperature." I would worry that G&T would simply argue that they would never make this claim. So, I would tend to rephrase it to use that example of the two sheets to address the question of whether the Clausius statement applies to NET heat flow or simply to any flows of heat without directly attributing the latter claim to G&T. I.e., just to state that there seems to be some confusion about whether the statement applies only to NET heat flows or whether it applies to any heat flow and then demonstrate by your example that it is completely absurd to believe that it means there can't be ANY flow of heat from cooler to warmer and thus that it clearly must apply only to NET heat flow and thus that one must consider all the heat flows and not just some of the flows in isolation from the others. Do you need any other contributions that I could assist with, perhaps in a non-technical explanation of the greenhouse effect (or something more mathy, but I'm keeping in line with your hope that this should be accessible to the educated laymen). I've updated again, used Joel's last suggestion, changed some language to simplify the argument, changed the first figure, etc. Upon reflection I think the last two paragraphs have to go because they offer too much opportunity to confuse the issue. We are going to get into arguments about the relative roles of convection, radiation and latent heat in driving the atmospheric heat engine. The paper should be as simple and straight forward as possible. At equilibrium, the temperature of the spherical body is obviously the result of energy input and part of that input comes from the first shell. So, by removing that shell (A), the temperature of the spherical body would have to drop to maintain the equilibrium with the "other" energy input (in the case of the earth, the sun), assuming that "other" input remained the same, of course. Anonymous: I wouldn't worry about the effect of the shell on the temperature of the spherical body. In the analogy to the system of interest, the spherical body is the sun...And, I think that we can assume the sun is big enough and dominated enough by its own heating processes to not have its temperature significantly affected by the shells. So, to constrain the spherical body to have a constant temperature is, I think, a very physically-reasonable assumption. At any rate, the purpose of this example is just to illustrate what the 2nd Law does or does not require and for those purposes, I see absolutely no problem with such an assumption. I think there's a distinction made between SW and IR, on the basis that SW passes through the atmosphere but does not interact (much) with it. The heat absorbed by the atmosphere (IR from the surface) is more than it radiates back to the surface (because the atmosphere also radiates to space). I think you are confusing two different things: Yes, the incoming energy and outgoing energy will be pretty close to equal because the earth is at most about a W/m^2 out of radiative balance. However, the question relevant for the question about 2nd law as applied to the earth and the atmosphere would simply be the exchange between those two systems alone. So, from that figure, if I am reading it right, you would have flows of 5%+24%+100% = 129% going from earth to atmosphere and 88% going from atmosphere to earth. I think in the shell example, using the introduction of shell B as the temperature varying event is not so clear, because it doesn't correspond well to the G&T argument. Why not just regard T_B as adjustable, showing that T_A rises if T_B does, even if T_B is cooler? The G.-T. argument strikes me as absurd upon its face, because of the structure of the radiative transfer calculations upon which the greenhouse effect is based. The fundamental equations of radiative transfer have the Second Law of Thermodynamics built into them, via Kirchoff's Law (which can be derived directly from the 2nd Law). Thus unless some fundamental error is introduced when the equations are solved numerically (and I have never seen any claim to that effect) the solutions ought to obey the 2nd law. This applies equally well to simple model systems such as described here, and to the most elaborate line-by-line calculations. That is a good point and I will add it, probably at the beginning, but the aim is to provide a refutation that is obvious to those who have had some scientific training. As you can see from the fact that G&T got published, it is needed. I disagree. Introducing Shell B corresponds to introducing an IR-absorbing atmosphere. However, if it feels more realistic to you, you can think of the case where Shell B is absent as instead having Shell B there but having it be completely transparent. I don't understand how you plan to make T_B adjustable. In that case, it would have to have its own energy source and that would tend to make the whole thing a worse analog of the system in question, not a better one. "8) After Schack (1972), water vapor is responsible for most of the absorption of the infrared radiation in the Earth’s atmosphere. The wavelength of the part of radiation, which is absorbed by carbon dioxide is only a small part of the full infrared spectrum and does not change considerably by raising its partial pressure." among others. I hope the technical level and approach is good enough, but if not, please let me know what additions or changes can be made and I will be glad to work more on it. Joel said "Anonymous: I wouldn't worry about the effect of the shell on the temperature of the spherical body. In the analogy to the system of interest, the spherical body is the sun"
That's unfortunate because it limits the argument. That's what I was getting at, at any rate when I said "the obvious next step". I don't think that anyone would really argue the latter fact, at any rate, but perhaps I am mistaken. Bart, in accord with the first law, the energy into the surface = energy out from the surface; and energy into the atmosphere = energy out from the atmosphere. What the second law says is that the flow from surface to atmosphere 100+5+24=129 has to be more than the backflow from a cooler atmosphere to the surface (88). This is where you see the net flow from the hotter surface into the cooler atmosphere. Space has net heating of the surface, which in turn has net heating of the atmosphere, which in turn has net heat expelled back to space. The atmosphere can be treated as a huge heat engine, and the net entropy export is the driver." I know it's picking nits, but I believe the "driver" is actually the temperature differential and the net entropy export is the smoke coming out the exhaust. Entropy increase, a necessary outcome (as far as we know) is really an effect rather than a cause. The fact that overall entropy (of the universe) must increase may restrict the paths that one can drive down, but does not determine what path one takes nor does it make the car move. Us bunnies love them tasty little baby lice. We share them with our birdy friends as they pick over the corpse of denial. The trick is to achieve precision consicely without losing the audience. I like the tail pipe bit. Ooooo, look Eli has provided something that can be Drudged. Eli, it would be helpful if you offered to extend Wikipedia's explanation of the Second Law of Thermodynamics. Over on Skeptical Science there is a commenter who seems to be taking that definition as gospel. I've been unable to find a concise explanation in an easily publicly findable site, that would prevent people from misinterpreting in this particular way right from the get-go. It's a lot easier to give people the correct mental model in the first place, than to help them modify an incorrect mental model. Over on Skeptical Science, a commenter named Gord has been pushing an anti-2nd-law argument I haven't seen before, though I have not read the G&T paper. Gord insists that the "heat" flowing from the warm Earth's surface to the cooler atmosphere is a continuous vector electromagnetic field that sums/interferes with the "heat" flowing from the atmosphere to the surface. He says that because that field propagating from the Earth to the sky is "stronger" than the one coming the other direction, the net result of the summing of those two fields is a "heat" vector field propagating solely toward the sky. There are many things wrong with his arguments and mental model, but that one particular misconception seemed novel. Several commentators have spent days valiently counter-arguing, to no avail. I finally offered the example of two objects that are emitting so few wave packets (photons) that occasionally a wave packet from one object travels all the way to the other object while there is no wave packet coming the other direction. That means there is no summing/interfering with an opposing wave packet, so the sole wave packet happily continues traveling until it hits the other object. Even if the emitting object is colder than the receiving object. That single example refutes Gord's proposed mechanism, but I would be shocked if he admitted that. Has anybody else seen Gord's argument before? I believe you've misrepresented G&T in your refutation of their argument. In their argument, G&T reference experimental data which show (they assert) that when carbon dioxide is added to a gas such as air, the effective thermal conductivity of this gas does not decrease in accordance with the greenhouse gas hypothesis. Thus, they claim, this hypothesis is invalidated as a general rule. In the experiments, I gather, a column of gas is bounded on one end by a hot plate and on the opposing end by a cold plate of equal area; all other surfaces are insulated. Absent the carbon dioxide, the heat flux from the hot plate to the cold plate is identical to the thermal conductivity of the gas times the temperature difference between the plates. Under the greenhouse gas hypothesis, the introduction of carbon dioxide reduces the net heat flux by the amount of the so-called "back radiation." Thus, the "effective thermal conductivity" (the net heat flux divided by the temperature difference) is reduced by the addition of the CO2. However, the mechanism by which heat is transferred by thermal conduction remains intact in the presence of CO2. This is by the transfer of momentum from relatively hot gas molecules to relatively cold ones. Thus, in order for the greenhouse gas effect to be operative in these experiments, an additional mechanism must be operative. By this mechanism, heat is transferred from the cold plate to the hot plate. However, under the second law, this transfer of heat cannot take place without work being performed. In the absence of this work, the greenhouse gas hypothesis fails (under the conditions of the experiments) for violations of the second law. I'm unable to identify a hole in G&T's argument. 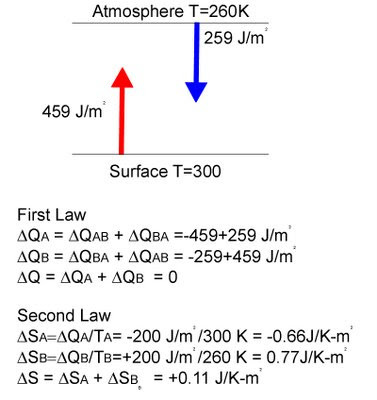 In particular, that heat which is added to the atmosphere by absorption of infrared radiation by carbon dioxide must be transferred anisotropically toward colder regions of the atmosphere rather than being transferred isotropically as assumed under the greenhouse gas hypothesis, for under this hypothesis, the second law is violated. An attempt at refutation of G&T would, it seems to me, have to start with an explanation of why the experiments cited by G&T fail to exhibit a greenhouse gas effect if it is true that this effect exists in Earth's atmosphere. Terry, you are missing the point, that conduction contributes essentially NOTHING to heat conduction in the atmosphere, which is dominated by convection, evaporation and condensation of water and radiation. You also repeat G&Ts major error. Take your example, you point out that the net interchange of energy is from the hotter to the colder (not at zero K) plate, however you, and they do not take into consideration that this is NET, energy flows from the hotter to the colder but also, a lesser amount from the colder to the hotter. If you removed the colder plate and let the energy flow out into space (effectively at absolute zero), the hotter plate would cool faster. The presence of the colder plate limits the rate at which the hotter one cools. I think the G&T argument proves that cavity wall insulation doesn't work. After all, the outside is cooler than the wall and the wall is cooler than the interior. It's completely impossible for the cooler wall to keep the interior warmer! Insulation is a scam! I think any argument that's incompatible with the existence of, say, blankets, has been reduced to absurdity. This comment comes in 2 parts. Interesting discussion. I would like to read the G&T paper and maybe comment on it in the future. I also want to reply to some of the comments above. For the moment (since I would like to get a couple of hours of sleep tonight), I want to post a simple result that addresses the sun issue. I was going to provide a link to this page when I realized that some of the assumptions for using a system of equations without derivatives wrt time is that we know the values at the point in time at which the system is being solved. I did later read a comment that says the system is fine in applying to a snapshot in time (rather than deal with assumptions about steady state). OK, fine. In fact, with the adjustment described below, it seems we can get the steady state values we want and not be limited to describing merely an instant in time (at least as per what is still a very simple model.. eg, since it assumes all shells have emissivity of 1). The model might be more intuitive if it is changed a little or otherwise clarified: The problem appears to be that, as the model description stands, the inner core's temperature is constant and this is confusing to people. It appears to be saying that the earth temp is constant, yet the argument (here and of CO2 warming) otherwise says that the inner shell gets heated up. shellA, the inner shell, gets constant power from the sun (sun's temp is not an issue, since, as also mentioned in the comments, the sun is far away and our radiation coming back at them has a negligible effect.. at least according to the already approximate constancy of the sun's irradiance). Now, we can allow the temp at shellA, TA, to vary. Simple. We no longer need to assume it is constant once we assume the sun's irradiance is constant. I think this makes the model a little closer to what most people would expect. Also, we note that the Sun's irradiance, to first order approx, reaches only the earth's surface, allowing for this simple model variation. [An improved model, eg, if/when a simple computer program is written, will also have irradiance at the ozone layer (ie, at one of the middle shells).] In terms of pictures, we keep the picture as is but slide over the Ts: T becomes TA, TA becomes TB, etc. Also, we then add a new line pointing at the inner shell. This line represents a constant sun radiation flux, and we omit the sigma T^4 and just call it S.
After adjusting the systems of equations, we solve for the shellA only case and then for the shellB case as well. The results differ a little since now the first shell (whose temp is unknown) only has one direction of radiation loss (ie, shellA radiation arrow points only outward/up from the body). Anyway, I'll wrap up by listing a few of the systems of equations. I'll be terse. A = TA^4, B = TB^4, etc. S is power flux from sun. I'll skip the sigmas since they are assumed to be 1. We can use http://www.bluebit.gr/matrix-calculator/linear_equations.aspx to solve the equations if we just assume S=100. The solutions will be something like (eg, for the shellD case): 400, 300, 200, 100. This translates to A=4*S, B=3*S, C=2*S, D=1*S. The fourth roots then follow when we derive TA, TB, TC, TD, etc. For example, for the 4 shell case, TA=1.414*S, TB=1.316*S, TC=1.189*S, TD=1*S. For the 3 shell case, TA=1.316*S, TB=1.189*S, TC=1*S. For the 2 shell case, TA=1.189*S, TB=1*S. For the one shell case, TA=1*S. The equation solver makes it easy to see the pattern as we add more shells.